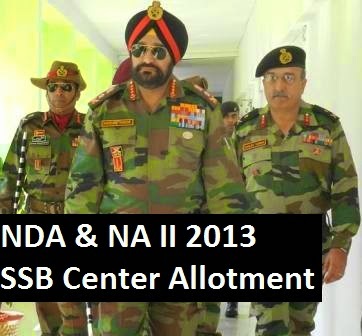 Have you passed NDA & NA exam and looking for SSB center allotment list? Check out Indian Army, Air Force and Navy's SSB center allotment list for candidates who passed NDA & NA exam II 2013. Check out NDA 132 and INAC 94 course center allotment list for the shortlisted candidates. NDA & NA II 2013 exam was held by UPSC on 11th August 2013. Candidates who are studying in twelfth class and those ho have passed 10+2 exam are eligible to apply for the course. Many candidates have applied for the test in order to fulfil their dream of becoming an officer in Indian Armed Forces. Admit cards were issued by UPSC for the written exam. Indian Army has officially published a list of 6182 candidates who are shortlisted for SSB interviews based on their performance in NDA & NA II 2013 written examination. All candidates will be appearing in SSB interview for the following courses. Candidates listed in the shortlisted candidate list of NDA & NA exam II 2013 should not send their original certificates to Army Headquarters as stated in Employment News paper published on 16th November 2013. Indian Army officially mentioned in its website that candidates need to take photocopies of original certificates along with original certificates to be taken to SSB interviews. Check center allotment list of NDA & NA exam II 2013.